Hayling Island Labs - After Hours: More bits of the synth turn up ..
More bits of the synth turn up ..
Work has unfortunately got in the way of play lately .. and then the weather has picked up nicely. 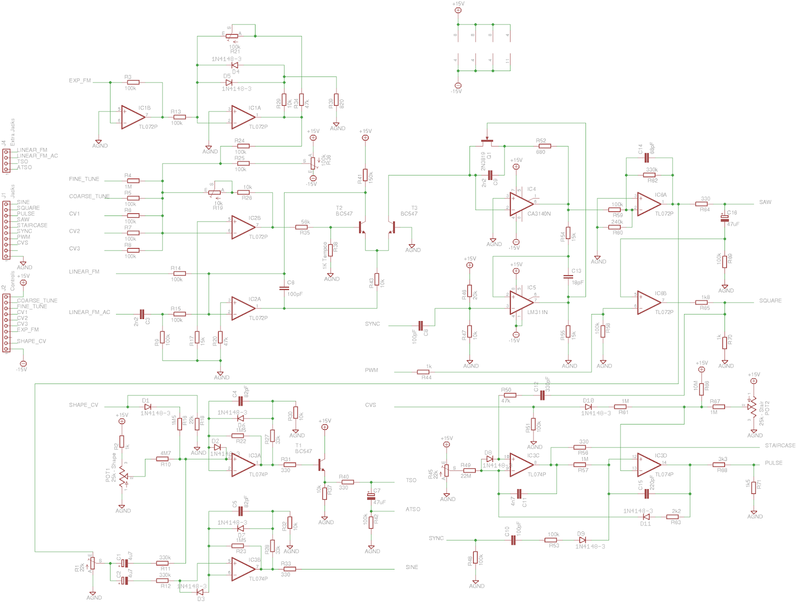 It's a glorious sunny morning this Sunday, the London Marathon is on, the US Masters later and I spent a chunk of last night putting a schematic of a VCO into Eagle, and crafting a PCB. 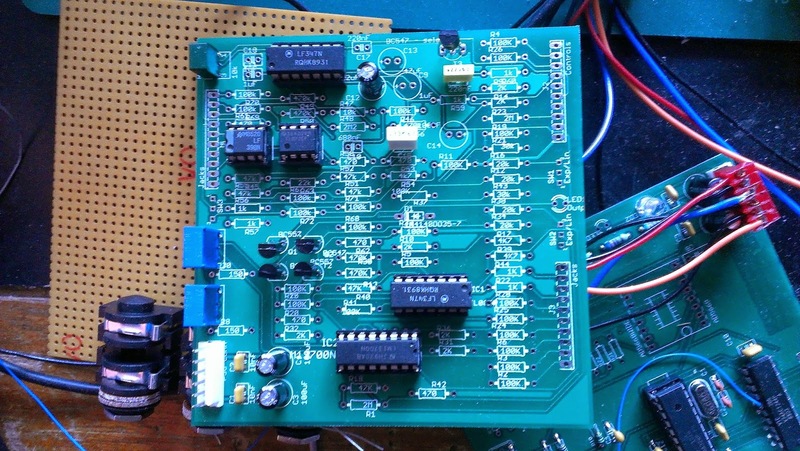 1) the multifunction VCLFO / ADSR board, and that is going well. I have a second style of DAC - an MPC4922 somewhere to try out - one that isn't £20 a go, but needs an external reference. The small daughter board idea for the DAC should serve its purpose well there. And so, before putting some clothes on, while the drill battery is charging I thought I would share the VCO design ..
First, the schematic. 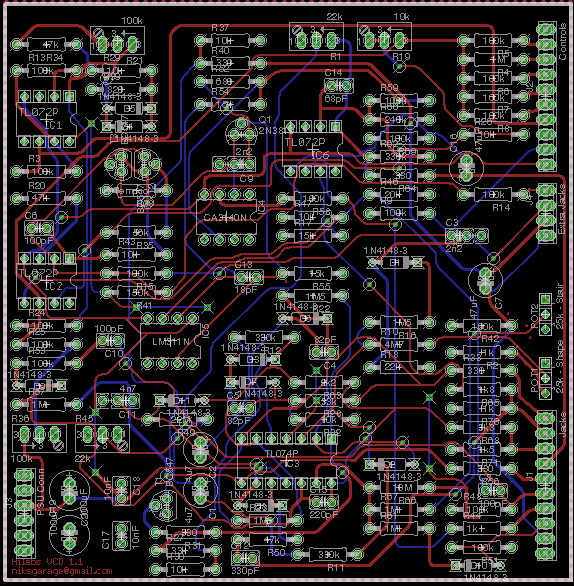 It's a well-known design based on Ken Smith's excellent VCO. I was going to borrow more of MFOS but this is a great starting point. It's probably not the only VCO I am going to cut a PCB for. Again, I have stuck to the same format as the other two boards - slighly less than 100mm on each side, and Itead provide 10 (or 11 apparently) PCBs, double sided, thru-hole plated and silk screened in your choice of colour (as long as its green) for $19 US, including shipping. Can't compete with it, except on time, as it does take 2-3 weeks to turn up once the order is placed.